Global Media Studies is unique in its coverage of places, peoples, institutions, and discourses. 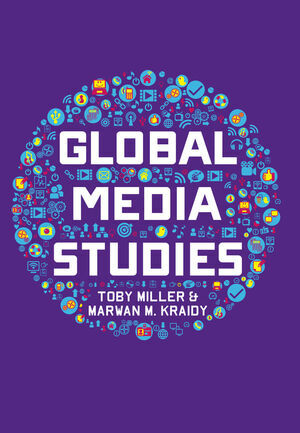 Toby Miller and Marwan M. Kraidy provide a comprehensive how-to guide to the study of media, going far beyond the established English-language literature and drawing on the best methods and research from around the world. They look at political economy, global policymaking and governance, and the past and present manifestations of cultural imperialism. In addition to providing a survey of the field, the book introduces a new form of textual analysis, with a special focus on reality television, as well as models of audience research. The authors include original analyses of the US, European, Latin American, and Arab worlds, and case studies of mobile telephony, the impact of US media, and reality television. Toby Miller is Professor Emeritus at the University of California, Riverside; Sir Walter Murdoch Professor of Cultural Policy Studies, Murdoch University; Profesor Invitado, Escuela de Comunicación Social, Universidad del Norte; Professor of Journalism, Media and Cultural Studies, Cardiff University/Prifysgol Caerdydd; and Director of the Institute of Media and Creative Industries, Loughborough University London. Marwan M. Kraidy is the Anthony Shadid Chair in Global Media, Politics and Culture and Director of the Center for Advanced Research in Global Communication at the Annenberg School for Communication at the University of Pennsylvania.